The 2015 Ford Fusion is an excellent mid-size sedan that is ready for you to meet it, and I am here to tell you all about what it can do for you! 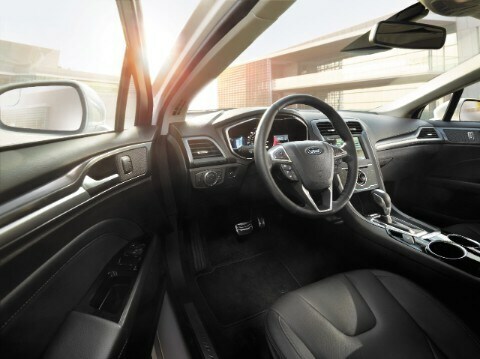 Did you know that the Ford Fusion won Autoweek magazine's Best in Show award at the 2012 North American International Auto Show, and EyesOn design honors for design excellence in a production vehicle? 2015 presents four new exterior colors: Magnetic, Tectonic, Guard and Bronze Fire Tinted Clearcoat Metallic. The 2015 Ford Fusion is made in two different locations: Flat Rock Assembly Plant in Flat Rock, Michigan, and at Ford's Hermosillo, Mexico, manufacturing facility. Continue reading on to learn more about the fabulous 2015 Ford Fusion! For fuel economy you may get up to 34 miles per gallon (mpg) highway and 22 mpg city, making for a fuel-efficient car. If you get the Fusion SE Appearance or Fusion SE Luxury package, you will have a 2.0-liter direct-injected EcoBoost engine with all-wheel drive. The EcoBoost engine is also available in a 1.5-liter version. If you get an EcoBoost engine with the vehicle, you will have twin independent variable camshaft timing. You may have a 2.5-liter engine, a hybrid-electric engine, a plug-in hybrid engine or a turbocharged engine. 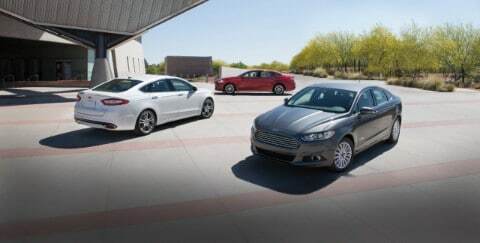 In total, there are seven different available powertrains for the 2015 Ford Fusion. You may have Auto Start-Stop and electric power steering. Your engine may have a double overhead cam (DOHC) and Inline-4 cylinders. For horsepower you will likely get 175 @ 6,000 revolutions per minute (rpm), and for torque you may get up to 175 ft-lbs @ 4,500 rpm, but if you get a turbocharged engine you could have up to 240 horsepower and 270 lb-ft of torque. Although the Fusion handles various driving conditions well, the ride quality is certainly not compromised due to that; your ride will be supported by a four-wheel independent suspension and a front and rear stabilizer bar! For a transmission you may have a six-speed shiftable automatic. The 2015 Ford Fusion has a design that impresses many people. There is a Terracotta package available on the Fusion SE and Fusion Titanium that includes 18-inch painted and machined alloy wheels, premium floor mats, Terracotta door inserts and Terracotta leather-trimmed seats--otherwise, your seats will likely be 100% made of cloth. If you get the Fusion SE, you will have a standard six-way power adjustable passenger seat, and the Fusion Titanium has a ten-way power adjustable passenger seat. The Fusion S will have 16-inch, 10-spoke alloy wheels to replace the older steel wheels with wheel covers. Configurable daytime running lamps are standard. The 2015 Ford Fusion is known to be a technologically-advanced vehicle. It has a USB connection with external media control, and offers speed-sensitive volume control. Rear seat passengers may like the available ventilation ducts, as they may make the ride all the more comfortable. There is also a split-folding rear seatback, incase you want to use the rear seat area for storage because you do not need it for people. You will have bucket front seats for the comfort of passengers. Four 1-touch power windows will make it so you do not need to manually roll windows up or down. In addition, you will have remote keyless power door locks that will prevent you from having to put a key in a lock to unlock a door. What are the city and highway ranges in miles for one tank of gas? They are 363 and 561, respectively. What is the cargo capacity when all seats are in their places? You will have up to 16 cubic feet available for cargo when all seats are in place. I need directions to Milnes Ford. Where can I plug in my address for accurate directions to you? Click here for accurate directions to us! The 2015 Ford Fusion offers a basic warranty for three years/36,000 miles. Tire-pressure monitoring will alert you if you need to stop to take a moment to fill up your tires to prevent yourself from getting a flat. A standard rearview camera will better help you see what is behind you, and will help you back into or out of parking spaces and driveways with less hassle. This car has a remote anti-theft alarm system to alert everybody around if someone may be trying to break into the vehicle. If you get into an accident, know that a post-collision safety system will be there to help you out. The car will also present rear passengers with inflatable seat belts. In addition, there is a rear center three-point belt to ensure that the passenger sitting in that seat has the same protection as all of the other car's occupants. Come check out the 2015 Ford Fusion today, give it a test drive, and see how it could be the new vehicle that you bring home! We are located at 333 East Genesee Street in Lapeer. You can also give us a call at (877) 859-5286 for more information on the 2015 Ford Fusion!